On Saturday Dec. 5, Soulspeak Asheville and The Fun Conspiracy will host its second annual youth poetry slam and open mic on the theme of “Happiness” (that other emotion) at Odyssey Community School from 7:00–9:30 pm. Tickets are $10 for adults and $5 for students and will be available at the door. Admission is free for slam participants and teachers. 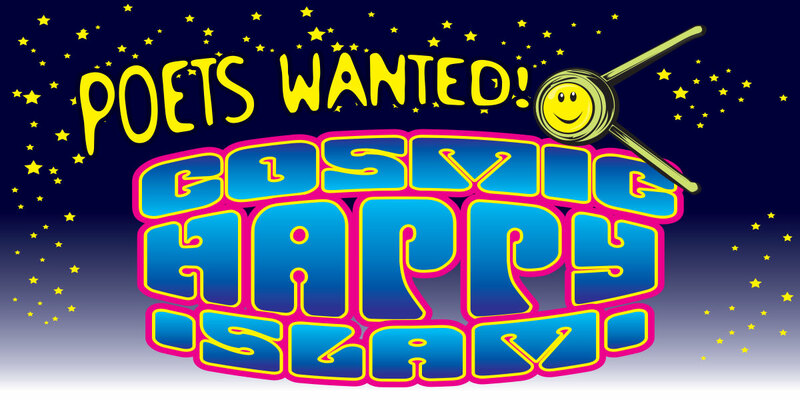 The Cosmic Happy Slam! 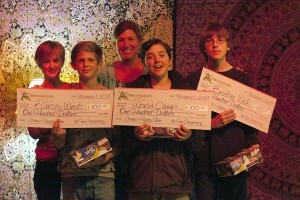 offers youth poets the opportunity to slam for charity, prizes and eligibility to compete for a spot on Asheville’s Brave New Voices team, which has finished in the top 10 teams in the world for the past 3 years running. Last year’s first annual Cosmic Happy Slam was a big success with 5 area middle and high schools represented, a humorous performance by Happy Slam judge and acclaimed performance poet Allan Wolf, and top-notch youth slam poetry that raised $300 for Brother Wolf Animal Rescue, Kairos West Community Center, and World Camp Inc.
Why Do We Need A Cosmic Happy Slam? “Teens are overextended and stressed, just like adults. This angst and discomfort is the stuff youth poetry slams are often made of,” shares Mel Kelley, Soulspeak Asheville’s founder and executive director. “The Cosmic Happy Slam is a reminder that even in the midst of our crazy, busy lives, we can always access joy, laugh and have fun. I want our kids to stay connected to joy,” Kelley adds. This Soulspeak slam is being sponsored by The Fun Conspiracy, who will donate cash prizes and $100 for each winner’s charity of choice. “All too often, our culture puts the spotlight on drama and negativity, which can be disempowering, especially for teens,” shares Ginny Hunneke, The Fun Conspiracy’s founder and head conspirator. The slam competition is open to youth ages 11-19, and advance registration is suggested as space is limited. Interested youth should email Mel Kelley at Soulspeakavl@gmail.com. For more details and information about a free Positive Poetry Playshop for Teens on Nov. 21, visit www.thefunconspiracy.com. Soulspeak Asheville is a community organization dedicated to empowering youth voices through poetry slams and open mics, showcases, and free monthly wordshops for youth poets ages 11-19. Soulspeak is co-managed by a youth board and executive director and adult mentor Mel Kelley. The Fun Conspiracy offers personal and professional fun coaching, playshops, retreats and public speaking engagements and sponsors community wellness events that are designed to cultivate opportunities for liberating joy in a safe, substance-free environment. More information at www.thefunconspiracy.com.